I've been doing a little research and testing Dolphin 7 with vps hosting. I used to think vps was a good alternative to a dedicated server. Which, I guess they could be in terms of price. It might depend on the vps hosting company. How much cpu power, ram, space, and the type of control panel they offer for the price. Which, seems to vary from one host to another. If we take a look at the standard or general Dolphin 7 requirements it says 128 MB's of memory/ram minimum required. Other people have suggested having a bit more around 256 MB's just to be safe. Most vps running linux along with whm/cpanel will consume 300-400 MB's of ram. That is a fresh install with just the linux operating system, and whm/cpanel control panel. No websites or other 3rd party software installed yet. So if you figure 400 MB's of ram give or take just to keep the vps up and running, you are going to need another 128 MB's to 256 MB's of ram on top of that to run Dolphin 7. That will put you at 528 MB's to 656 MB's of ram available. That does not even include RMS yet, not to mention what system backups will use, or any additional software might use. I recently installed RMS on a vps for testing purposes and it alone used around 220 MB's of ram. That was with no connections being made either. So if you intend to install or run RMS, then you are up into the 748 MB's to 876 MB's of ram for just the basics. That does not include any user activity to your Dolphin 7 site, or any actual RMS connection usage yet either. Some of the 512 MB vps plans or less with whm/cpanel won't be able to handle Dolphin 7 with your own RMS. 768 MB plans will barely, but they will not have much memory to spare to actually use your site and rms. 1024 MB (1 GB) to 2048 MB (2 GB) vps plans would be much more suitable for Dolphin 7 with RMS to run efficiently. These will run $60-$100 per month though, which is a little costly for a lot of people. Once you start looking at the various prices and plan offerings you might start to think about a full dedicated server. You could get a decent 2-4 core server with 2-6 GB's of ram, plenty of hard drive space, and generous bandwidth for $100-$150 per month. The server would be all yours and not shared with other vps users. You really don't know how many other vps accounts a host puts on their servers. Some hosts do put quite a few on their and oversell them just like shared hosting. You could tweak the heck out of a vps and reduce cpu and memory usage, but it is time consuming and tedious if you do not know what you are doing. 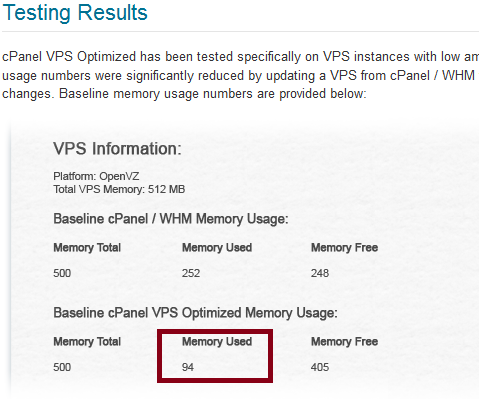 Cpanel suggest that they have optimized the control panel for vps systems to use less ram. I still do not know where they come up with these numbers in this screen shot. If they got it down to 94 MB's of ram usage I would like to know how they did that. I have yet to see a vps with whm/cpanel use only 94 MB's of ram no matter how much tweaking you do. But, according to them it is possible somehow. The drawbacks to vps is you really should have some server administration skills, along with familiarity with whm, linux command line knowledge, and that type of thing. They are not something you want to jump into if you do not know what you are doing. Most vps hosts give you a fairly simple install and it is up to you to secure and harden your system. And, there is plenty that should be done before putting live sites on it. You can do many things with the graphical web interface WHM instead of using the command line. However, it can screw up or time out. More important things you do or administer should be done with ssh command line to help prevent issues. Anyway if you got the cash and knowledge required to run a vps, then get at least 1024 MB's or 1 GB of ram or more. If you can spare a little bit more consider your own dedicated server. There are some decent priced vps hosting packages out there now, but like shared dolphin hosting you really never know how many other accounts they put on the same server. If you do not even know what WHM, ssh, command line, even is then try to avoid vps. It will probably be too complicated and frustrating for you. Consider more expensive commercial, business, or semi-dedicated hosting plans that allow your site to use more cpu and ram. Let a host take care of the server side administration instead. Find a host that has dolphin along with rms available. Or, find a 3rd party rms provider to use in conjunction with more expensive hosting that allows you to use more resources instead.